Are you a qualified and motivated student committed to learning Army values and standards? Do you find the idea of becoming a leader and bettering your community appealing? Would you like to understand your own personal leader-ship style? Drew University partners with nearby Seton Hall University to offer you student membership in the Army Reserved Officer Training Corps (ROTC). Army ROTC is a leadership program that allows cadets to both attend college as a regular student and train to commission as an officer in the U.S. Army upon graduation. Cadets are coached to become leaders of soldiers, guiding our Army and nation to good world standing. Those who complete the program begin with the rank of second lieutenant in the U.S. Army. Students may request to serve as an officer in either the active Army or part time in the Army Reserve or National Guard. ROTC at Drew through Seton Hall makes use of learning beyond lectures—from hands-on team building to making ethical and moral decisions to the training involved in developing your peak physical strength. As one of three New Jersey Army ROTC host universities, this ROTC program—the Pirate Battalion—includes Seton Hall students, as well as students at Drew and other North Jersey universities. Located in South Orange, New Jersey, Seton Hall is 12 miles from Drew. Most students make the 20-minute drive twice a week in their own car, a campus rental ZipCar or with a fellow student. Learn more about Army ROTC scholarships. Basic Course. Two Years That Prepare You for Life. You’ll complete the Basic Course your first two years in college. Each semester, take one elective class, a leadership lab and physical training. What you learn—basic military skills and fundamentals of leadership—form the groundwork for becoming an Army leader. No military commitment necessary. Advanced Course. Graduate With a Degree in Leadership. You’ll complete the Advanced Course your last two years in college. Each semester, take one elective class, a leadership lab and physical training, plus a summer leadership camp. What you learn—advanced military tactics and team organization, planning and decision-making—further develops you as an Army leader. to serve as an U.S. Army Officer after you graduate. Study applied leadership theory, communications, principles of war, military operations and tactics. Study command and staff functions, law of war, weapons, team dynamics, peer leadership, military operations, tactics. Study training the force, military justice, ethical decision-making, personnel management, cultural awareness, post and installation support, military operations and tactics. 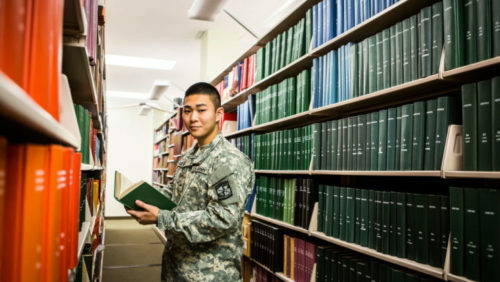 Learn more about the Army ROTC curriculum. High school students interested in a four- or three-year ROTC scholarship should begin the process early in their senior year by going to the U.S. Army’s ROTC website to start the application process online. Candidates must be qualified academically, physically and medically to earn an ROTC scholarship. For more information on ROTC requirements and what the program offers, contact James Skiff at cadm@drew.edu. Each semester, you are required to enroll in a physical fitness course based on the Army Physical Fitness Standard. The program concentrates on developing, sustaining and continually improving your cardiovascular, upper body and abdominal strength. Army ROTC also offers opportunities for students to lead and manage programs toward fitness excellence.